I’ve never really put pen to paper to tell my family’s seizure story. I’ve perfected the five-minute overview version, which I can usually deliver now without tears. But the long version, the one that captures how seizures changed everything I thought I knew about health, medicine, parenting, and control—that version, for many months, has been too painful to put down in words. The truth is I can barely utter the word “seizure” out loud without my stomach turning. I prefer to whisper it, so as not to awaken the beast. Paranoia: There is a constant fear that everything your child does that seems the slightest bit abnormal is a seizure, or a precursor to a seizure, or evidence of a seizure you somehow missed. No sure fix: There isn’t a single seizure medication that works for everyone, and most seizure medications don’t work for most people (this is not a Z-pack for an ear infection situation). Helplessness: There is rarely anything you can do to prevent or stop a seizure aside from administering rescue meds that can knock your child out for days—and those you’re only supposed to give after first watching your child seize for a very long time. The outline was long, but you get the idea. As I went through the list trying to explain each point in detail, I kept coming back to our story, which forms the basis of all of my nasty opinions about seizures. Nothing about our story is terribly unique. Every family visited by the seizure monster has a similarly harrowing tale. Still, I’ve decided that instead of a checklist, I’m going to share our seizure story as I’ve experienced it. If there are lessons or comfort others can take from it, I’m glad. If it’s just another seizure story, I suppose that’s okay, too. My daughter Nora began having seizures when she was nine months old. The seizures were a consequence of brain damage she suffered during and after a routine GI surgery (her fourth—she was a preemie, that’s a whole other story) because the proper fluids weren’t hung. When my husband and I first came back to the recovery room to see Nora after that surgery, I noticed her eyes were pulsing strangely. It was subtle, but noticeable to me. I pointed it out to the nurse. He told me the eye movements “were a common pain response.” He gave Nora morphine and she drifted off to sleep. The eye movements were not a pain response. They were seizures. I noticed them three times more while we waited for hours in the recovery unit for a room to open up on the main GI floor. Each time I saw Nora’s eyes shake, I thought she was in pain, and I requested more medication to keep her comfortable. I didn’t know that as I sat beside her, holding her tiny hand, she was experiencing profound and rapid brain death. It would be days before anyone, including the doctors, fully realized what had gone so terribly wrong. The first night after surgery, I continued to notice strange things. 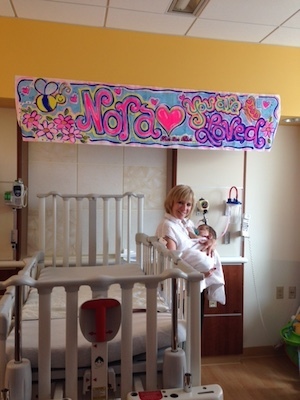 By that time, we were in the PICU because Nora had suffered a prolonged tonic clonic seizure that didn’t respond to the usual rescue medications. Nora appeared to be stabilizing as the night wore on, but I remained fearful. Even though I was assured that the overnight EEG was merely a precautionary measure, every little movement my sleeping child made spooked me. I wondered if I was imagining things. I stared at Nora all night long. The following morning, before dawn had even broken, I saw Nora’s eyes tremble again. I screamed. When the attending came in and examined Nora, she told me to relax, that Nora was just “drunk on medication” and possibly experiencing minor withdrawal symptoms. I believed her, but a call from the EEG technicians a moment later confirmed my fear—it had been another seizure. The attending told me she was “humbled” by my “maternal instincts.” I was totally horrified. How could the doctors and nurses at this first-rate teaching and research hospital not know what a seizure looked like? How could my fried brain and new-mother instincts be reading the signs better than anyone else in the room? I thought I was in the twilight zone. But I soon learned that when it comes to seizures, no one, not even the very best neuroscientists on Earth, really knows what you’d hope they would. 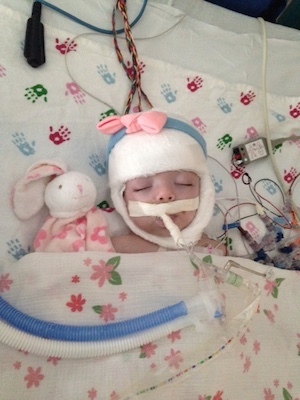 As the day continued, the EEG showed one seizure following the next, though Nora hardly moved at all. The seizures “kindled” from small, localized sparks to global wildfire, and the situation spiraled very quickly out of control. In a matter of days, the seizures had increased with such momentum, Nora had be put into a medically induced coma—literally shutting down her brain to a near flatline—to give doctors time to figure out what the heck was going on. She was intubated, several PICC lines were placed, medicine pumps were stacked one on top of another across a series of IV poles that spanned a full wall of her hospital room. Nora nearly died in that coma—her lung collapsed and she developed a blood clot in her jugular vein—and still, some of the best and smartest doctors in all of Chicago had no idea why the seizures were so severe and why they wouldn’t stop. Ten days later, Nora was brought out of the coma to save her life, but the seizures quickly returned when her brain came back online. There was no plan. For months, we tried one drug after the next in what appeared to me to be a total crapshoot of a treatment plan. But this haphazard drug attack is actually how you treat seizures. At one point, Nora was seizing through a cocktail of twelve antiepileptic drugs. When I closed my eyes on the cot in her room at night, all I could see was a looping replay of the scariest commercial from my childhood: the egg sizzling in the frying pan. “This is your brain on drugs.” They were frying Nora’s little brain. And still, she seized. Finally, after eight weeks, we were fortunate to obtain relative seizure control (for many, that relief never comes). We were discharged home on seven antiepileptic drugs and a rigorous dosing schedule, certain that the worst was behind us. We—and everyone else—were wrong. It wasn’t long at home before Nora began to have screaming fits upon waking and falling asleep. The blood-curdling screams came in pulses, one after another, for up to 20 minutes at a time. The first time Nora screamed like this, we rushed her to the emergency room, thinking her bowel was obstructed by scar tissue. By the time we arrived, though, she was calm. We had her checked out anyway, but the ER team , who conferred with Nora’s GI specialist and neurologist, chalked the screaming up to gas pain and sent us home. The screaming continued, and it increased in frequency and intensity. We made an appointment at the clinic and asked for help. The doctors continued to believe the screaming fits correlated with GI pain. They’d noticed through weekly blood labs that Nora’s liver function was badly compromised by the sheer amount of seizure medication her liver was processing. Her enzymes were elevated eight times above normal levels and her liver was enlarged. This, we were told, was a possible source of pain, and could have been the cause of Nora’s screaming fits. To prevent irreversible liver damage (and hopefully relieve the apparent discomfort), we had no choice but to wean Nora off as many medications as we could. As we did, we monitored Nora’s brain activity closely, in weekly or biweekly EEGs. But even as the medications came off and Nora’s liver returned to normal, the screaming fits continued. All the while, we were assured by the epileptologist that Nora’s brain activity, though abnormal and epileptiform, was stable. But Nora stopped eating. Then she stopped smiling, making eye contact, showing interest in toys, in people. She stopped doing very much at all. Besides screaming. We got a second opinion. The epileptologist at the second hospital read the EEGs differently than the one at the first. He told us that Nora was developing a rare and extremely disorganizing electrical pattern in her brain called hypsarrhythmia. We shared this information with Nora’s original epileptologist, who, looking at the exact same images, continued to disagree that there was an increase in brain instability. Both doctors are world-renowned. Impossible to believe, I know. We switched hospitals. The second doctor, it turns out, was right. But even he didn’t know everything about everything. He was kind enough, however, to tell us as much. Seizures, it turns out, are one of life’s great and terrible mysteries. Under the new doctor’s care, we checked our daughter into the hospital for an extended video EEG and enrollment in a clinical trial for children with pre-spasm hypsarrhythmia. While Nora was in the hospital’s epilepsy unit, hooked up to dozens of probes and under the watchful eye of doctors trained specifically to spot and diagnose epilepsy, the night fits continued. They did not register on the EEG as seizures, and the doctor, after reviewing video footage of the events, assured us that Nora was still in a “pre-spasm” state. As we were discharged home from the epilepsy unit, we were told we had caught the progression of abnormal brain activity just in time. At our first follow-up appointment as part of the study two weeks later, Nora had another screaming fit upon waking from a nap. It looked exactly like the dozens (maybe hundreds) of screaming fits my husband and I had seen before, though this time she was upright in my arms when it occurred, not laying on her back. This particular event registered on the EEG as a seizure. As it turns out, EEGs only capture seizures starting on the surface of the brain, and even those are only captured most of the time and can be impacted by the patient’s position. Seizures that begin in deep brain structures often elude detection altogether. 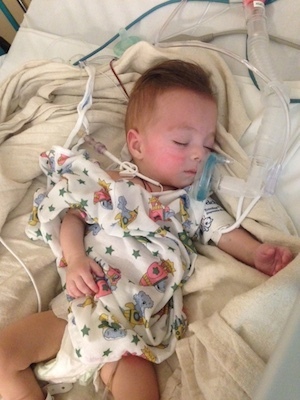 The neurologist recorded the event in Nora’s file as her “first” infantile spasm—a devastating, catastrophic seizure. Of course, my husband and I knew that Nora had been having these spasms for months. What we had been told was “just in time” was actually many, many weeks too late. I googled until I’d read just about everything the internet had to say about infantile spasms. I found a support group on Facebook. I realized how subtle and difficult to detect this particular type of seizure can be, and I learned how differently different children respond to medications. Still, I tried my best to figure out what might work for Nora. I took ideas to our doctors based on success stories we and others found on the internet. But many of the things other parents swore by did nothing for Nora, or made her seizures worse. Frequently, I would hear or read about alternative treatments that seemed to be working for little ones who didn’t respond to the usual medications. I would research them myself, figure out how to procure them, and just as we were starting to administer them at home, the original source of the idea would report that the treatment wasn’t working after all. 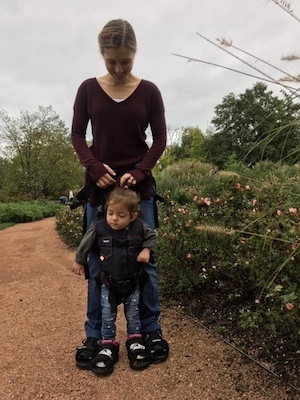 Since the infantile spasms diagnosis, Nora has been through six rounds of steroids, three or four new seizure medications, and, of course, CBD, essential oils, chiropractics, and prismatic glasses. All have helped and then not helped and then helped when adjusted or in combination. It’s a constant scramble, and hard to tease out exactly what’s what. In the end, we really just take it one day at a time. There is no checklist when it comes to seizures. No instruction manual or how-to guide. There is not a single guarantee that something (or anything) will work to stop seizures, and there is no way to predict what might be looming on the horizon. Seizure-freedom is counted in days, and the ticking-clock is impossible to silence. We’ve been living with Nora’s seizures for about 18 months now. There have been many hospitalizations, a few life-threatening scares, and lots and lots of medication and research and experimental therapies and stress. But, like everything, in time things have gotten easier. We know now, and accept, all that we are incapable of knowing. We understand our daughter better, have better insight into her risk factors and warning signs, and trust far more than we used to that seizures will never take Nora’s spirit or dampen the joy she brings to our lives. And, most fortunately of all, Nora has experienced some recent reprieve in the last few months and is enjoying her life again. She is smiling and giggling and seems to be keenly aware of the love that surrounds her and the awe she inspires. 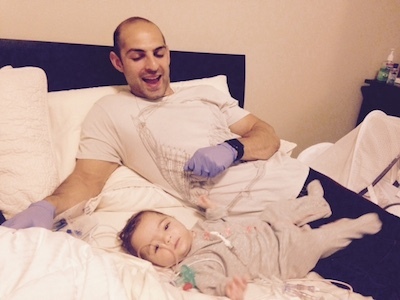 Lauren Schrero is the proud mother of Nora Levy, a former micro-preemie bravely battling two rare diseases–Short Bowel Syndrome and Infantile Spasms. Nora is the inspiration behind The Nora Project, an educational curriculum designed around Common Core standards to teach empathy and spark meaningful relationships between children and their peers with disabilities. Lauren is an avid reader and researcher and huge fan of Complex Child. She is honored to be a contributor.